The variant of Popcorn Time most closely linked with the edition shut down by the MPAA last year has announced its official return, or debut depending on one's perspective. The fork is promising "resilience-driven development" based on the parallel development of the 'legal' Project Butter. Nevertheless, the entire 'market' remains murky. Last October the most popular Popcorn Time fork and the one most-closely linked to the original project shut down its website PopcornTime.io. With rumors flying the worst case scenario eventually reared its head, with confirmation that the MPAA had filed a lawsuit against the project’s developers in Canada. The legal threats triggered a domino effect and several other contributors ceased working on the platform. However, earlier this month people with outdated versions of the PopcornTime.io software began receiving updates declaring “Hail Hydra”, and with that the application started working once again. Surprised at this sudden reanimation, TF asked around to find out who was behind it but no one wanted to claim responsibility. That’s understandable – no sane person wants the MPAA’s lawyers monitoring their every move. However, just over a week later and we now have the first official statement from the people behind the reincarnation. Noting that an explanation is long overdue, the team (located at popcorntime.sh) are now attempting to clarify their mission and point out where they stand in what has recently become an extremely confused and messy ‘marketplace’. “After the ‘MPAA incident’, we’re a little diminished, and we’ve chosen a new direction: we’re shifting from an active development of Popcorn Time to a more or less resilience-driven development,” the team announced. Although at this point the team aren’t being more specific, in this case ‘resilience’ appears to be avoiding the fate of the people who became known to the MPAA last year. Some of those people were quite open about their work on Popcorn Time and few measures were taken to hide identities, which in hindsight was probably their undoing. This time around things seem to be taking a different shape. Instead of working on what is probably an illegal application, it appears that the software’s former developers are now working on ‘Butter‘, a relatively new streaming project with neutral technology and no illegal content. However, the work and development that goes into Butter will then be leveraged by a separate team to power the variant of Popcorn Time using the .SH ccTLD. “Most of our old teammates have left the ship to focus on a new technology, they called it Butter, and we use their platform as a base to make Popcorn Time,” the team says. So what we appear to have here is a line being drawn in the sand. On one side is Butter, a project that developers can work on (possibly) without fear of being tarnished with the stigma of Popcorn Time. On the other, people working on a Butter-based Popcorn Time who hope that they don’t suffer the same fate as their predecessors did last year. The team behind the new variant has also addressed the question of monetization of the Popcorn Time platform. The founding ethos, which was only adhered to 100% by the original, original project, was to make no money. Generating money is seen as an Achilles’ heel by some and the PopcornTime.sh team say they will return to a zero revenue setup. “We’d like to add that we do not accept any donation and have no interest in monetizing Popcorn Time by any way: our philosophy hasn’t changed,” they note. But far beyond the dangers of monetization and the wounds inflicted on Popcorn Time by the MPAA, the ‘brand’ has been tarnished in recent months by a crowded marketplace filled with Popcorn Time clones, copies and wannabees. The new team also addresses these problems. So what is the current state of play? Well the problem from potential users’ perspectives is that no one is really able to say absolutely definitively which forks are totally trustworthy and which ones aren’t, since everyone is keen to hide their identities and remain unaccountable. As a result it’s no longer possible to publicly point to a set of trustworthy developers and use their credentials to give credibility to a project. Not to say that some haven’t tried, however. A diagram that has been circulating on Reddit attempts to put the current mess into an easy to understand format but claims that the Time4Popcorn fork (which incidentally has offered the most consistent service throughout) is somehow untrustworthy have never been backed up by solid proof. Also, since no one is prepared to confirm who is behind the .SH version, users simply have to take their word for it that they are somehow linked with and/or trusted by the .IO team that was taken down last year. That assumption does generally exist but since there is no consistency and no public face it’s almost impossible for anyone to give it an official stamp of approval. Perhaps the most important point is no matter who one speaks to about any variant of Popcorn Time, there is nearly always an element of bias. Some point to open source being the yardstick, others suggest that making no money is they key. Most users simply don’t care as long as free movies appear. In future the proof of the pudding will probably have to be in the eating. 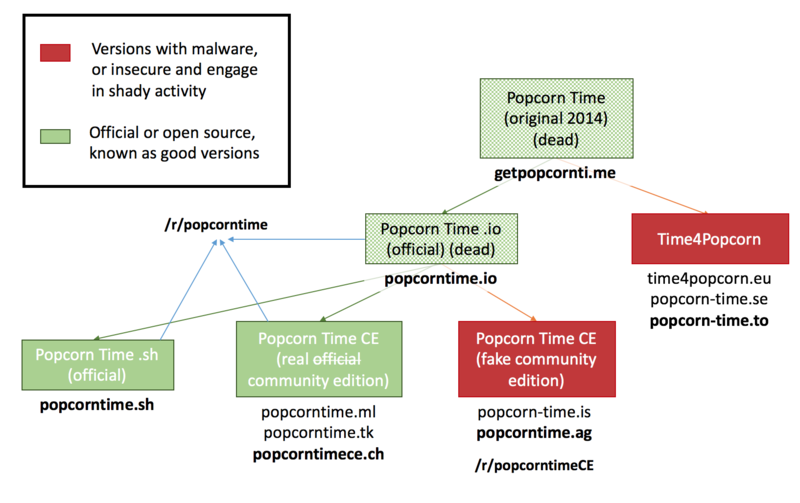 In any event, at least for now there appears to be three main editions of Popcorn Time (loosely PopcornTime.sh, Popcorn-Time.se and PopcornTime.ml popcorntimece.ch), each with their own lines of development but only the former based on Butter. Whether it’s wise for them all to carry the same name is a matter for them but in any event confusion is likely to persist, as is the ever-looming threat from Hollywood.